In a perfect world, homeowners would make their all mortgage payments on time and the banks would be happy. As long as banks are getting their money, the banks aren't very much interested in talking about taking a short payoff on their loan known as a short sale. When a bank believes the security for its loan is in jeopardy and/or the seller is destined to become delinquent and stop making mortgage payments, the bank is then interested in talking about doing a short sale. Sometimes, the fact that a home is underwater is enough to induce a bank to consider a strategic short sale. But most of the time the bank wants the seller to have a hardship, in addition to negative equity. 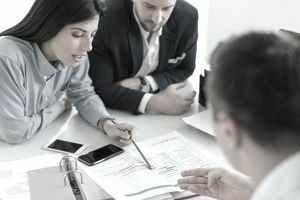 If a bank is a stickler for details (and most are) the bank might not talk to any random potential buyer who calls to discuss a particular short sale. That's because the bank will most likely require a third party authorization to be signed by the borrower. The borrower is unlikely to sign this authorization, which would allow a complete stranger access to the borrower's personal information, which would be anything discussed regarding his loan with the short sale bank. This doesn't mean you can't send an offer to the bank yourself, but just be aware that the bank is unlikely to contact you directly and might route the offer back through the listing agent. Your problem will be finding an agent who is willing to draw an offer for you. Agents want to get paid for their work. The most common way a buyer's agent gets paid is by the listing broker. The REALTOR® Code of Ethics specifies how agents are to interact with each other, and a buyer's agent cannot go around or interfere with a listing agent's business. This means you will need to draw up your own offer or contact a short sale lawyer to write an offer for you. You might not want to worry about all of the details and simply write a letter to the bank, along with proof of funds and a preapproval letter, explaining the price you would like to pay. You may need to do your own property search of the public records all by yourself. It is fairly easy to find out which lender originally made the loan for the borrower, but many loans are sold over and over. However, most records are kept in digital format nowadays, so it's relatively easy to do a search at the courthouse or County Recorder's office. Bottom line is the seller is the owner of the home. The bank is simply a secured debtor. The bank does not do the short sale; it approves the short sale and its payoff. It is the seller who deeds the home to the short sale buyer, which is why the seller gets to choose who buys it. Sellers generally have little incentive to try to get the highest price possible. Listing agents are reluctant as well, due to fallout from HVCC, because they know that the price a buyer will pay is not always the price a buyer's lender will approve. Low appraisals can be a common problem among buyer's lenders. When a second offer is received from a buyer, the seller knows submitting that offer to the bank will probably start the process over, and sellers don't want to start from scratch. Therefore, sellers generally request that the offer is accepted as a backup offer, but withhold it from the bank. It's the seller's prerogative, the seller's home. The bank might not want to see another offer, either. The bank wants market value from a qualified buyer. Your best option in these scenarios, if you really want to make an offer directly to the short sale bank, is to offer all cash and more than list price.